What are Some Of The Best Log Debarkers in 2019? If you’re undertaking a woodworking project like making furniture or a log cabin, you’ll probably need a log debarker. Some masochists also debark logs for firewood. In their defense, insects can nest in between the bark and the wood (especially if you’re storing firewood over the summer). People also use bark for mulch and kindling, though peeling it from a log is very time-consuming. In this article we found some different kinds of debarking tools that could save you a lot of time. 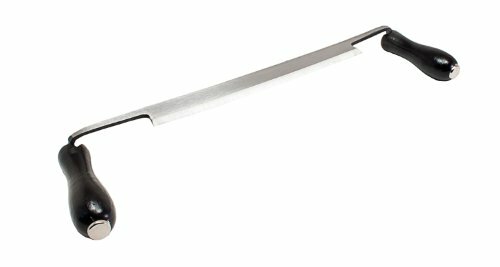 Timber Tuff TMW-08 Bark Spud, 24"
Timber Tuff TMB-08DS Straight Draw Shave Tool, 8"
There are two main types of log debarker. The first type fits onto the end of a chainsaw and uses the rotating head to power the tool. This provides a nice automatic shaver that can strip bark in seconds. The second type, is the completely manual shaver tool, probably something that many of you are used to using. These are tough work to handle but something many carpenters like, as it retains the natural beauty just under the bark. Some other methods people use are air chisels, pressure washers (which are good for removing sap), and even pry-bars! The method you should use depend on the results you are looking for. If you want quick results and are not too bothered about the appearance of the log, go with a chainsaw attachment. If not, a barking spud or good drawknife is probably what you’re looking for. Always ensure your chainsaw is strong enough to handle the extra strain a log debarker will add. Sometimes, bearings will quickly wear out on a cheaper chainsaw while using a log debarker. Another thing newcomers to woodwork might forget, is that if you do purchase hand debarking tools, you’ll need to leave a little in your budget to purchase a quality sharpening block and oil. Nothing is worse than working timber with dull blades. We recommend sharpening at least every month if you’re a daily user. It’s also easier to debark logs in the spring when cambium (cell tissue) becomes active and the buds begin to break. This is why basket makers cut in the spring. In the summer the bark beetles come out, and you’ll want your work done by then! The sooner you peel a log after it hits the ground, the easier it will be. Here’s 4 quite different log debarkers for different preferences and budgets. This tool falls into the chainsaw mounted mechanical type of debarker. It’s been designed to attach to all chainsaws that are 65cc or under. We tested this debarker on pine softwood, striping the bark of trees that had recently been felled. We found it really did make light work of bark, stripping it off in one go and easily working through an individual log in double quick time. The tool is reasonably easy to dismantle, although we feel you’ll be best to have a chainsaw dedicated to stripping if you’re regularly working felled logs. The blades can be replaced with standard 3 1/4 ones from most makes, including Makita. We liked this price of the Log Wizard and also liked the ease at which is stripped wood. The only issue was the dismantling on the tool which could become a pain if you were using it frequently. Okay, we’re looking at a totally different type of tool here. This time, we’re reviewing a barking spud. For those of you who don’t know, a barking spud is something that’s used to gently pull back the bark of a tree. They’re also known as “Log Peelers”. The bark spud is perfect if you’re looking to get your hands dirty and want to strip your logs in a more refined way, with a finish to match. Spuds are better than draw knives for thicker bark such as Eastern White Pine, Poplar and similar, thicker-barked trees. Whilst using this spud, we found it to be extremely well made, easily putting it into the category of craftsman’s tool. It has a nice wooden handle (No plastic here!) and the tip is made from toughened steel. The handle and tip are jointed very well and should last for many years before being replaced. 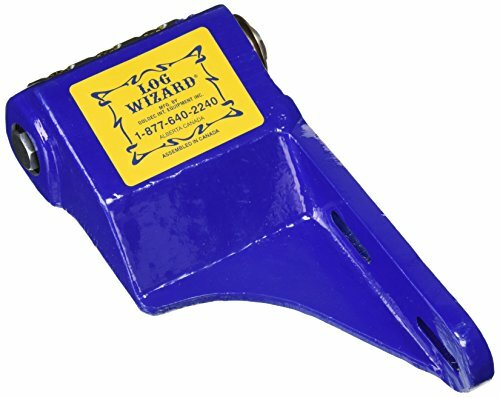 As far as dimensions go, it’s 24″ long and 2 3/8″ wide, about right for this type of tool and easily held in your hand. It’s also 3lbs so there is enough heft to help cutting but it’s not overly heavy. Obviously, you can’t compare this tool with a mechanical bark stripper. However, it’s an effective tool if you want to achieve a more sympathetic job or need to use your debarked logs in a decorative setting, such as a bridge or decking construction. Another all manual tool, this time we’re sticking with the stripping rather than peeling bark off with a good drawknife – again from Timber Tuff (no bias but they are leaders in this field!). The Timber Tuff drawknife, has an 8 inch blade, 5mm thick at the top of the wedge and has a 30 degree angle, suitable for most people. As with the barking spud, we’ve picked this one for quality too, as it offers a good quality pair on handles that look somewhat inspired by old Stanley tool of decades past, something I remember my father using. During our test, it performed admirably, although as with all hand carpentry tools you’re mileage will vary depending on the training or experience you bring to the table. What we can say though, is that the little Timber Tuff will certainly power through most barks and does leave a nice pleasant finish. As for maintenance, the steel is HRC 30 rated in strength so if should last fairly well between sharpening. Of course as with all hand cutting tools, you’ll have to invest in a decent sharpening block and oil to keep this blade working at it’s best. We recommend this as as log debarker if you need to be a little gentler on your timber as your stripping it. It’s perfect if you’re building garden furniture or you have smaller construction jobs that require nicely finished debarked timber. Timber Tuff make drawknives for 5″ all the way up to 13″ so you can size accordingly. Ox-Head have been making axes, hatchets and other blades for around 250 years, so they bring a heck of a lot of skill and experience to the table. The OX3752500 is another drawknife, this time of the 10″ variety. It is made one one solid piece of steel. You can expect it to last for 3 – 4 hours of hardwood use before it’s needs sharpening. The contoured wood handles are mounted well so there’s no blade play or wiggle. When this knife arrived we needed to give it some attention with a grinder or stone to get it hair-shaving sharp. So you need to be mindful of this, but to be honest it’s not uncommon for blades to arrive in this condition. The reason is the workman can put on the type of edge they need for specific tasks. We used it to shave the bark of an oak limb. Once we got the hang of it, the bark came off it sheet. We also noticed it cuts through logs and branches stumps pretty easily too. One thing woodworkers will really appreciate is you can use this tool to round and square-off posts to give that classic hand-made look. Overall, this drawknife was a lot of fun! How To Buy Good Firewood For Less!